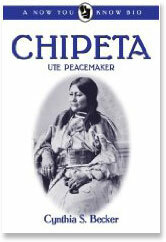 Chipeta went shopping in Washington, DC on January 27, 1880. Accompanied by Henry Andrews of the Indian Bureau, she visited Trunnel, Clark & Company located in a market on Pennsylvania Avenue. She purchased $27.99 worth of fabric and sewing notions. The purchase was charged to the Indian Bureau. February 2, 1880 – Clerk J.C. Brown noted receipt of the bill by the Department of Interior, Indian Division. February 11, 1880 – The bill was reviewed and approved by William Stickney and E. M. Kingsley, Ex. Commissioner. A final official Treasury Department document was completed, restating the nature of the appropriation and authorizing payment. This document was signed on February 14, 1880 by Jesse Arnold, Clerk of the Second Auditor’s Office, and on February 20, 1880 by J.C. Brown, Clerk of the Second Comptroller’s Office. All of the documents prepared in order to effect payment for this purchase became part of Indian Claim No. 629. The documents are preserved in the National Archives (Reg 217, Stack 12E3, Row 8, Comp 27, #629-1880). And when did Trunnel, Clark & Company receive payment? Ah, those documents are in another file somewhere among Treasury Department records. Our country, right or wrong. When right, to be kept right; when wrong, to be put right. This quote at the bottom of an “A.Word.A.Day” email first caught my attention because I recognized the source from my research. CARL SCHURZ, as U.S. Secretary of Interior, welcomed Chipeta as a member of the 1880 Ute Indian delegation that arrived in Washington, D.C. to discuss a treaty after the Meeker Massacre occurred in Colorado. I saved this tidbit in my Chipeta files. Rediscovering it today, I was struck by the wisdom and timeliness of this German immigrant’s words.